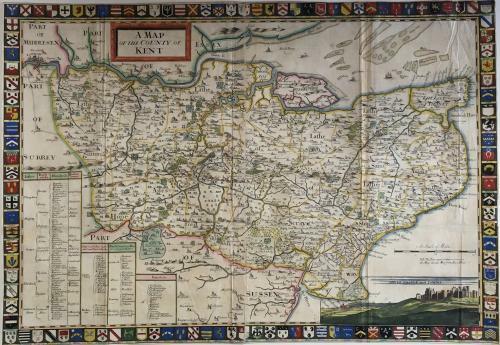 Title: 'A Map of the County of Kent' from Harris’s History of Kent. A large and very ornate map of Kent, showing the towns, roads, rivers, hills and woods. The “Lathes, Bailywicks and Hundreds” are coloured in outline, and listed in tables at lower left, along with lists of the cities, ports and franchises. The map has an inset view of Dover Castle and the town at the lower right. A colourful border of 118 coats-of-arms of Kent families surrounds the map. Blank verso. The map has very tight margins but the paper is generally bright and the colour is superb. An excellent example of this rare and large map.